The London of the artistic, sporting, and theatrical sets, as well as those who hoped to recreate a little of the Continental elegance and rousing debates of Parisian brasseries or Viennese coffeehouses, convened in Soho. 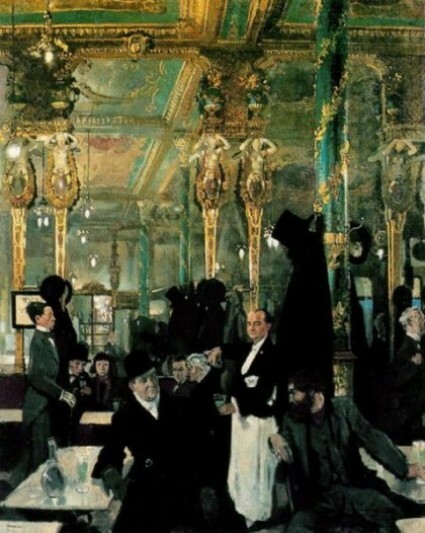 Here popped champagne–drunk from a Gaiety Girl’s dainty slipper–; succulent oysters were tipped down throats; and in the later Edwardian era, the illicit pleasures of a nightclub could be found. Alongside this were bookstalls that sold “naughty” French novels wrapped in yellow book covers, diverting markets where one could find a whole host of defective or secondhand goods, Bohemian clubs, and street corners filled with radical European exiles and socialist-minded British rousing the rabble against capitalism and the social order of the day. A true essence of Cosmopolitan London, a passing visitor to Soho could brush shoulders with people of various ethnic and religious groups from all corners of the world. “Sportsmen have always had a special affection for the Cafe Royal. The men who were prominent in the revival of road-coaching were all patrons of the restaurant, and any night you may see half-a-dozen well-known owners of race-horses dining there. The Stage, the Stock Exchange, and Literature also have a liking for the old house, and hunting men love it. When I mentioned it as the ideal place for a dinner of bachelor gourmets, I did not mean that men do not bring their wives and sisters and sweethearts there. They do. But the Cafe Royal does not lay itself out to capture the ladies. I never heard of anyone having afternoon tea there, and when a lady tells me that she likes dining at the Cafe Royal I always mentally give her a good mark, for it shows that she places in her affections good things to drink and good things to eat before those “springes to catch woodcock,” gipsy bands in crimson coats, and palm lounges. In the great gilded cage of the restaurant and the big room the windows of which open on to Glasshouse Street, the custom is to eat the lunch of the day, or to select dishes from it, while dinner is an a la carte meal. Around the eve of WWI, the youth of London high society began to penetrate Soho and its cosmopolitan delights, with duke’s daughters and Foreign Office clerks continuing the very Victorian trend of “slumming”–and they considered themselves daring and anti-establishment for even breathing the merest whiff of Bohemianism. Despite this, Soho was, at its heart, a homey mecca for many immigrants in London, where they could forge and cement connections between the New and the Old World.